From the My Little Pony collection by ICUP. My Little Pony Rainbow Dash Be the Character Apron. From the My Little Pony collection by ICUP. 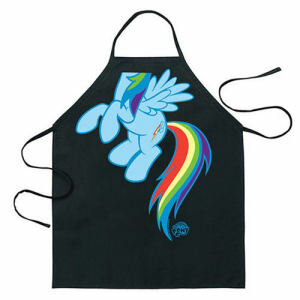 My Little Pony Rainbow Dash Be the Character Apron. One Size Fits Most! Size: 27in W x 31in H (68.5 cm x 79 cm), 24in (61 cm) neck loop, 33 in (84 cm) waist tie. ICUP My Little Pony Attire shipping from Canada. No Surprise Border fees or Customs!